Enjoy social media, but not sure how to use it to augment your training programs? Here are a few suggestions. Are you speaking to a new group or organization? When you send your notice about training, add your professional social media accounts (such as LinkedIn, Twitter or your blog) to your email signature. People can easily learn more about you and your work if they choose. It’s subtle but easy to do. 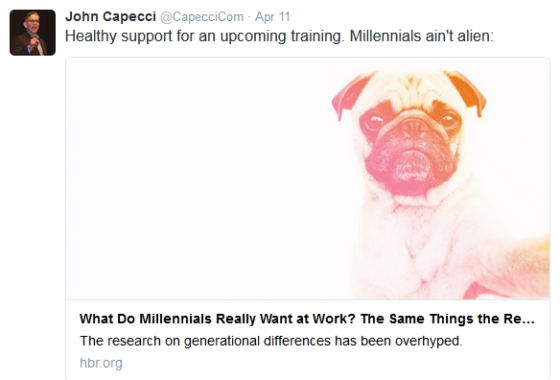 You can also post content relevant to your upcoming training. Why not try to engage learners before you even meet them? 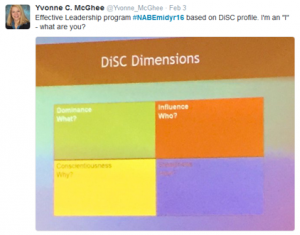 Suggest that they use the #EverythingDiSC or other hashtag. Provide your Twitter, Instagram or other account username so they can share directly with you, too. 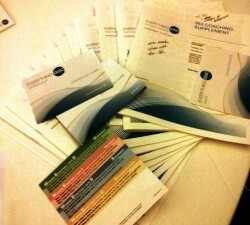 Some businesses and organizations have internal social media channels, too, that participants could post to. Participants should abide by whatever rules govern those sites. Show DiSC style images from our Pinterest pages. Ask them to review the images for their style and discuss with others which images resonate with them and which ones don’t. Discuss how one’s dot placement and other factors can make a difference in how much you identify with the strongest descriptors of your style. Play a short clip of an interview or talk and ask the group to discuss how they might make quick people-reading assessments of the speakers. 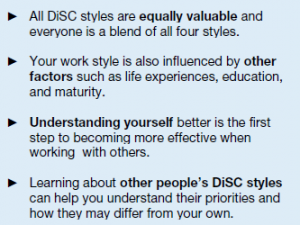 Use one of the Everything DiSC Interaction Guides and ask questions such as: What do voice inflections, hand gestures, clothing, word choice and tempo of speech contribute to your predictions? How does seeing only a talking head make it more difficult to read a person’s style? Could any of these personalities be presenting a style that’s not really the one with which they are most comfortable? 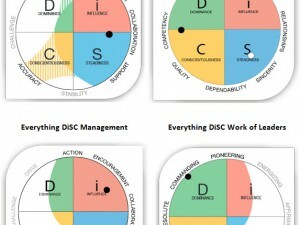 Does it help to think in terms of DiSC priorities rather than DiSC styles? When is people-reading a useful tactic? Use the slides from DiSC Styles and Dr. Seuss Quotes to engage your audience in making their understanding of the styles a little more fun and clear. Go to your favorite social channels and thank the organization you just trained and say how much you enjoyed working with them. Share an insight you gained because of their participation. Ask them how they would prefer to be identified online (by Twitter handle, department name, organization’s name, a generic description). If your training is broken into several sessions, use social media to provide opportunities for review of the content presented in the previous session. 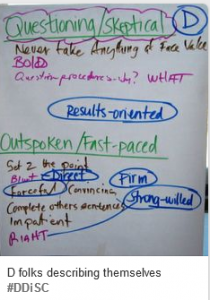 Post an answer to a question brought up during training or provide additional details. 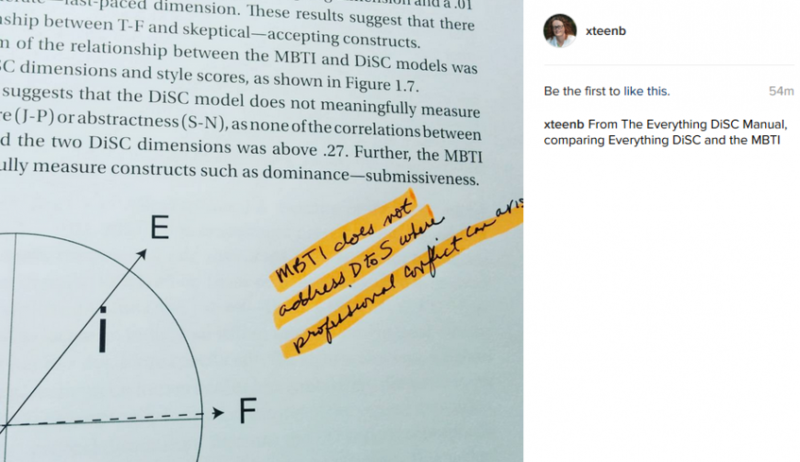 Here’s an example showing how the Everything DiSC Manual addresses the difference between Everything DiSC and the MBTI posted to Instagram. Poll the group. Ask about snack preferences so you know what to provide at the next session or ask a question related to the training you provided earlier. Gauge the knowledge level of the topic you’re about to introduce. Or use it as part of an ice breaker exercise. Remind participants to share their Workplace Style Guides. 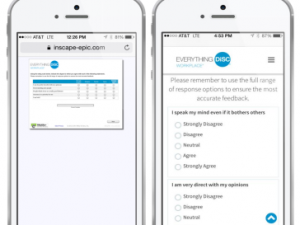 Ask if your participants are sharing their styles with new team members. Share a link to a new article or provide a style-related tip. 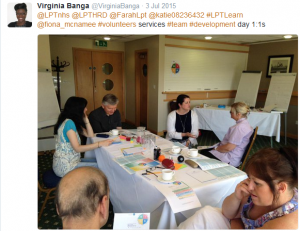 More tools become available to trainers all the time and using them can keep both the trainer and participants engaged and learning. Learn where your audience hangs out in social and engage with them there. Be yourself, don’t worry too much about the quality of any photos you take and have fun. Please share how you use social media in the comment section. If you’re using a new app or platform, please share it’s working out for you and your learners. 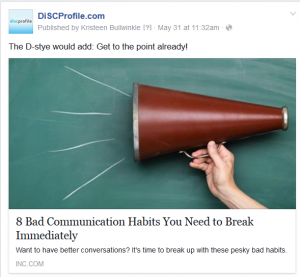 You’ve been asked to complete a DiSC profile, now what?